If this contest between the Tampa Bay Buccaneers and Chicago Bears was a heavyweight fight, as billed, then it was one with an unheard-of punch count. 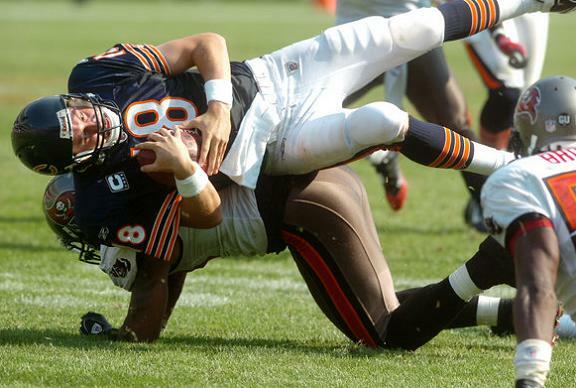 Quarterback Brian Griese landed the most damaging blows. Making his return to Soldier Field, where he played the last two seasons, Griese threw a team-record 67 passes for 407 yards, directing a 10-point comeback in the game's last minute. He then engineered a 90-yard, game-winning field goal drive to give the visitors a stunning 27-24 victory. Griese completed 38 of those passes – two shy of the team record in that category – none bigger than the 38-yard strike to WR Antonio Bryant 10 minutes into overtime. Bryant was tackled at the Chicago six but that was enough to set up Matt Bryant for the clinching kick, a 21 yard no-doubter with 4:21 remaining in the sudden death period. Griese was intercepted three times but he rallied for an emotionally-draining victory against his former teammates. His second and third picks led to second-half touchdown drives, giving Chicago a 24-14 lead with less than seven minutes to play. However, Griese directed a 63-yard field goal drive and then, after the Bucs' defense had forced a quick three-and-out, used the final two minutes to drive his team 79 yards for the game-tying score. Jerramy Stevens, who caught five passes for 61 yards in his first game of the season after a two-week suspension, scored the game-tying touchdown on a quick six-yard slant with seven seconds left in the game. The win was the first by the Buccaneers in almost a decade in a game in which they trailed by 10 points. They last accomplished that feat against the Detroit Lions on December 12, 1999, winning 23-16 after trailing 10-0. The Bucs had nearly pulled off the feat two years ago in Chicago, rallying from 31-17 down in the fourth quarter at Soldier Field to force overtime before losing, 34-31. Griese found nine different receivers for his 38 completions, favoring Bryant with a game-high 10 passes for 138 yards. WR Ike Hilliard, starting in place of the injured Joey Galloway, caught six passes for 57 yards and a score. Griese's final line – 37 of 68 for 407 yards, two touchdowns and three interceptions – stands as one of the most prolific in team history. He surpassed the previous record for attempts by six, topping Brad Johnson's 61 against Carolina on September 14, 2003. The completions were topped only by Johnson's 40 against the Bears on November 18, 2001. And his 407 yards is only the third 400-yard game in team annals. Amazingly, Griese was not sacked the entire afternoon. Despite those incredible passing numbers, for one half the game went according to the anticipated plotline, with two stifling defenses making big plays. The Bucs had the biggest of those, as DE Gaines Adams returned his first career interception 45 yards for a touchdown in the first quarter. The Bucs led 14-9 at halftime, but Chicago came out swinging in the second half nearly knocked the visitors out with two late touchdowns following interceptions. Until well into the second half, it looked like Adams' play would be the decisive shot. However, Nathan Vasher's sliding pick at the Chicago 14 kept Tampa Bay from padding the 14-9 lead that had resulted from Adams' play. To that point in the game, Kyle Orton and the Chicago offense had managed just 156 yards against a Buccaneer defense that had matched the Bears play for play. Orton found his rhythm after Vasher's pick, however, immediately leading an eight-play, 86-yard drive. Orton found impressive rookie RB Matt Forte for a six-yard scoring pass to cap the drive, then converted the two-point conversion with a pass to WR Brandon Lloyd. Orton finished the game with 22 completions in 34 attempts for 268 yards, two touchdowns and two interceptions. Forte caught seven passes for 66 yards and a touchdown and ran 27 times for 89 yards. 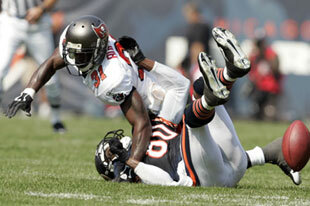 The Bears out-rushed the Buccaneers, 158-47. The Bucs simply couldn't run the ball against Chicago's max front, averaging 2.8 yards on 17 carries. Eventually, the Bears' offense rolled to 405 yards, but the Bucs came on late to get to 454. LB Barrett Ruud's acrobatic interception in the end zone in the second quarter helped Tampa Bay keep Chicago out of the end zone before halftime. The Bears got Forte isolated on Ruud, who managed to follow the back step for step down the sideline. Reaching out blindly for the ball just as Forte leaped for it, Ruud managed to knock it out of Forte's hands, then make an impressive juggling catch of the deflection. The Bucs got good pressure on Orton throughout the afternoon, notching a season-high three sacks. CB Ronde Barber, who had one of the sacks, also teamed with Ruud to pressure Orton Adams' interception. Orton tried to lob the ball over Barber's head to Forte on a screen play but Adams intercepted the pass and returned it 45 yards for a touchdown. Orton gamely tried to keep Adams out of the end zone, and the play was originally ruled down at the one. However, the Bucs challenged the end of the return and it was ruled that Adams got the ball over the goal line before his feet hit out of bounds. That gave the Bucs a 14-6 lead after they had originally trailed 6-0. With emotions running high, the Bucs lost their poise a bit at the very beginning of the game. Afer a four-yard completion on the game's opening play, T Donald Penn was flagged for some extracurricular activity after the whistle. On the ensuing second-and-17 from the Bucs' 12, Gruden had to call a timeout from the sideline just before time expired, as Griese was having trouble getting an audible communicated to the entire offense in time. The sequence didn't get any better from there. Griese's next pass was supposed to be a little dump over the middle, but it was tipped at the line by Urlacher and intercepted by Briggs, who returned it three yards to the Bucs' 15. The Bucs' defense, on the other hand, did start the game nicely. CB Ronde Barber's perfectly-timed blitz on third-and-10 resulted in a seven-yard sack and led to Robbie Gould's 40-yard field goal to open the scoring. A taunting penalty on the Bears' coverage team helped the Bucs start their second drive on their own 36, but it went nowhere and the Bucs had to punt for the first time. Bidwell boomed a 56-yarder that helped push the Bears back to their own 23. Chicago's ensuing drive was an impressive one. Orton completed three of four passes for 35 yards and Forte ran five times for 17 yards as the Bears consumed 52 yards on a 10-play march. However, a stop of Forte for a loss of three at the Bucs' 30 by Cato June helped stall the drive before the red zone, leaving the Bears to settle for another Gould three-pointer, this one a 43-yarder. A holding penalty on LB Adam Hayward negated most of a 38-yard kickoff return by Clayton, but the Bucs still busted into Chicago territory two plays later. Griese threaded an impressive 14-yard pass to Bryant to start the drive, and an 18-yard run by Dunn on a draw moved the ball just over midfield. Griese then lofted a 31-yard pass over the defense to TE Jerramy Stevens, who was tackled at the Chicago 19. The drive eventually reached the four, where the Bucs faced a third-and-goal. Gruden spread the field with four receivers (including tight ends) and Hilliard ran a little curl just over the goal line. Griese fired a low, hard pass into Hilliard's stomach as two defenders descended on him, giving the Bucs a one-point lead with two minutes to play in the first quarter. The good feelings didn't last long, as S Danieal Manning, filling in nicely for the injured Devin Hester, returned the next kickoff 46 yards to the Chicago 48. 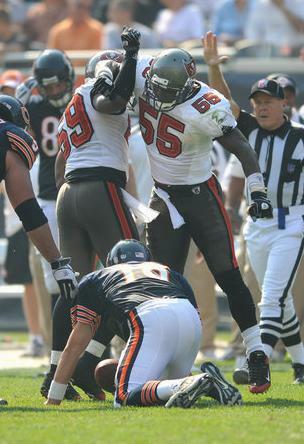 DE Greg White helped the Bucs force a three-and-out near midfield, however, as he sacked Orton for a loss of five. The resulting punt sailed into the end zone for a touchback. Unfortunately, the Bucs' offense gave the ball back two plays later. Stovall caught a short pass and tried to turn upfield but CB Charles Tillman poked the ball away and it was recovered by Urlacher at the Bucs' 38. Ruud's incredible end zone interception kept that turnover from hurting the Buccaneers, however. Neither offense did much more until the midway point of the second quarter, when a 12-yard scramble by Orton got the Bears moving. A perfectly-executed screen pass to Forte picked up 19 down to the Bucs' 40, but a sack by Kevin Carter and, on the next play, Adams' interception put the Bucs up 14-6 with five minutes to play in the half. Tampa Bay's defense stopped the next Chicago drive near midfield but Bears coach Lovie Smith made a bold call, snapping the ball to RB Garrett Wolfe on a fake punt. Wolfe had a wide-open field in front of them after he cut through the line, and WR Dexter Jackson's tackle at the Bucs' 18 was the only thing that prevented a touchdown. Tampa Bay's defense held again after that bit of trickery, but the Bears still netted a field goal off the play, a 28-yarder by Gould that made it 14-9 at halftime. The Bucs' defense forced a three-and-out on the opening drive of the second half but Brad Maynard's 50-yard punt pushed Tampa Bay all the way back to its own 13. That proved to be a good field-position swing for the home team when the Bucs failed to gain a first down and the ensuing punt only put the ball back to the Bears' 47. Still, Tampa Bay's defense held strong, with CB Marcus Hamilton breaking up a deep sideline attempt to WR Marty Booker on third-and-five from midfield. Hilliard executed a fair catch at the six on Chicago's punt, but FB B.J. Askew got the Bucs out of trouble with a fingertip catch of a third-and-one rollout pass that was good for 18 yards. Griese converted the next third down, too, on a 14-yard strike over the middle to Bryant. Now at the midfield stripe, Griese found TE Alex Smith for a gain of 20. However, three plays later Griese and Bryant seemed to have a bit of miscommunication on a medium-range pass on the left sideline, and the result was an interception by Nathan Vasher at the Chicago 14. The Bears' offense responded with its best drive of the game to that point. WR Rashied Davis' tiptoe catch on the sideline put the ball at the Bucs' 33 and Orton then threw a beautiful floater down the left seam to Lloyd for a gain of 27. On first-and-goal, Forte split out in the left slot and caught a quick stop pass over the goal line for a touchdown. A successful two-point conversion gave Chicago a three-point lead near the end of the third quarter. The Bucs' next drive stalled quickly but a penalty on the following punt pushed Chicago back to its own 10. They drove into Buccaneers territory again but finally fizzled out at the Bucs' 31. Gould came on to try another field goal – this one would have tied his career long of 49 yards – but he pushed it wide right, leaving the Bears lead at three points with 11 minutes to play. The miss also gave the Bucs possession at their own 39. However, facing a third-and-eight a few plays later, Griese overthrew Stevens and the pass went straight to Chicago S Kevin Payne. Payne returned his interception 12 yards to the Chicago 46. The Bears turned that takeaway into a touchdown, too. A six-play, 54-yard drive ended in Orton's 19-yard touchdown pass to Lloyd in the back left corner of the end zone. Chicago thus had a 24-14 lead with less than seven minutes to play. Tampa Bay started at its own 20 after a touchback and, operating in a no-huddle, moved quickly into Bears territory with a series of passes over the middle. A third-and-four completion to Stevens at the Chicago 17 against a heavy blitz moved the chains, though the clock was down to 3:30. The Bucs got no closer and had to settle for Matt Bryant's 35-yard field goal, which did serve to make it a one-score lead with 3:11 to play. The Bucs' defense also got the stop it needed, forcing a punt at the two-minute warning. The Bears managed to get eight yards on two Forte carries, but a third-and-two bootleg run by Orton failed to fool the Bucs' defense. June tracked Orton down before he could run around the right end and stopped him at the Bears' 28. The Bucs' last-chance drive began at its own 21 with 1:49 to play. An impressive 18-yard strike to TE Jerramy Stevens on third-and-10 put the ball at midfield. Griese then hit Clayton for 13 more and the Bucs called a timeout with 56 seconds to play. A crossing route to Hilliard was good for 17 more, but a potential touchdown pass to Stovall was broken up by Tillman. Griese kept the Bucs alive with a 19-yard pass to Bryant, who was tackled at the one-yard line by S Mike Brown. Tampa Bay used its final timeout with 12 seconds to play. A first-down pass was incomplete, but Griese threw a quick slant to Stevens for the touchdown with seven seconds to play. The Bucs elected to kick the extra point to tie the game. Tampa Bay won the first battle in overtime, calling the coin toss correctly and getting the ball frist. Starting at their own 23, the Bucs got 11 yards on a draw play by Dunn, then eight more on a pass to Stovall. After a seven-yard pass to Bryant got the ball down to Chicago's 39, Griese was flagged for intentional grounding, setting up second-and-20 from just inside midfield. After two incompletions, the Bucs had to punt, and Bidwell dropped it down at the Chicago 14. Orton converted the first third down of the drive with a crambling, 24-yard completion to Lloyd, putting the football at the Chicago 44. Orton nearly put the Bears in field goal position with a long pass over the middle of the field on the next third down, but Davis let the pass go through his arms as two Buccaneer defenders closed in. The Bears had to punt, with Maynard angling a long kick out of bounds at the Tampa Bay seven. The Bucs appeared to be on the verge of punting it back when CB Charles Tillman drew the 15-yard flag for his part in a wide-ranging scrum in the end zone. That gave the Bucs a first down at their own 25. A tipped pass was nearly intercepted by Briggs moments later, but Griese converted a third-and-10 with a quick strike to Clayton that gained 17 yards. Griese's strike to Bryant occurred on second-and-10 from the Bears' 44. After one three-yard dive by Graham, the Bucs sent in the field goal unit and Bryant put the game away.